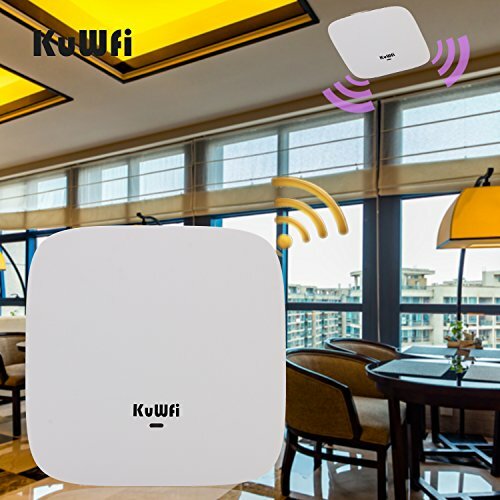 A770 is an 11ac dual band indoor ceiling mount wireless access point for hotels, cafe, hospital,school, shopping mall and home. the A770 can be installed on a wall or ceiling to blends in nicely with most interior decorations in the house, to extend optimum wireless signal. Work with WLAN Controller, centralized configuration and management, easy to achieve Wi-Fi Coverage and maintenance, access into Cloud Server to do remote monitor and Captive Portal authentication for more business value. 750Mbps dual 2.4GHz and 5.8GHz high performance ceiling mount wireless access point with Qualcomm Chipset, 5dBi omni antenna, with , then 24V Passive PoE support for easy install. PCB board with external PA, LNA circuit, more RF Power and higher receive sensitivity, improved the wall-pass-through capacity and increased Wi-Fi range. Power over Ethernet(PoE)-Integrated 24V Passive Power over Ethernet (PoE), work with 24V passive PoE switch or PoE adapter, plug and play, installed in areas where power outlets are not readily available, eliminating the mess of altering existing network infrastructure. Build in Wi-Fi Channel Analysis Tool for best channel-Build in Smart Channel Analysis Tool, help to select the less Wi-Fi Interference channels, ensure the stability wireless signal supply a stable wireless coverage. Multiple SSID and Tag VLAN Support-It support multiple SSID up to 4, different SSID can banding different VLAN ID to achieve user isolation and data security.